For the second time in as many weeks, the redshirt junior receiver made the catch to put the Miami Hurricanes in position to win the football game and remain the only undefeated team in the ACC. Miami senior kicker Michael Badgley made a 24-yard field goal with just four seconds left, and the No. 11 Canes defeated the Georgia Tech Yellow Jackets 25-24 in a nail biter on Saturday afternoon in Hard Rock Stadium. Miami was down by two with the ball, and it was fourth-and-11 on the Georgia Tech 43-yard line with 36 seconds remaining in the final quarter. The Canes needed a field goal but were too far away to try it. That’s when Rosier lobbed up a pass for Langham. At first, the ball bobbled off the defender’s hands, but Langham maintained his focus to catch the ball while falling – a 28-yard completion to the 15-yard line. Now UM was close enough, and the team closed it out under pressure – a common theme to the season. Langham finished with a career-high 100 yards receiving on five catches. Miami’s (5-0, 3-0 ACC) biggest bright spot on offense was sophomore running back Travis Homer, who played his first career start at the position. He led the Hurricanes with a career-high 170 yards rushing and a touchdown on 20 carries. Homer also added a 17-yard touchdown reception in the second quarter. Homer replaced the injured Mark Walton, who is out for the season after undergoing surgery to his right ankle last week. Miami struggled for consistency in the passing game on offense. Rosier had some tough moments, missing open receivers at times throughout the contest. But just like in every game this season, when it counted most, he made the pass to lead the Hurricanes to victory. Rosier completed 23 of his 37 passes for 297 yards and a touchdown. He has thrown at least one touchdown in every game this season. He now has 12 passing touchdowns to just three interceptions on the year. The Yellow Jackets’ (3-2, 2-1 ACC) defense, which ranks sixth in the country, gave the Canes all it could handle at Hard Rock Stadium, sending an array of pass rushers to get constant pressure on Rosier. In the first half, Miami could not stop the Georgia Tech’s explosive, triple-option offense. However, in the second half, the Hurricanes clamped down. The Yellow Jackets still managed 226 yards rushing, but they are a team that came into the game averaging close to 400 yards on the ground per game. So, the Canes consider this a win in the defensive column. For the second-straight game, junior safety Jaquan Johnson led UM on defense with eight total tackles, including one for a loss, and a pass breakup. Senior defensive end Chad Thomas totaled four tackles, 1.5 for a loss, and a sack. He has now recorded at least one sack in three of the last four games. On the final Miami possession, Rosier went to senior receiver Braxton Berrios four separate times to keep the drive going, just like he did against Florida State last weekend. Berrios, once again, rose to the occasion for the Hurricanes. He finished with six receptions for 44 yards. 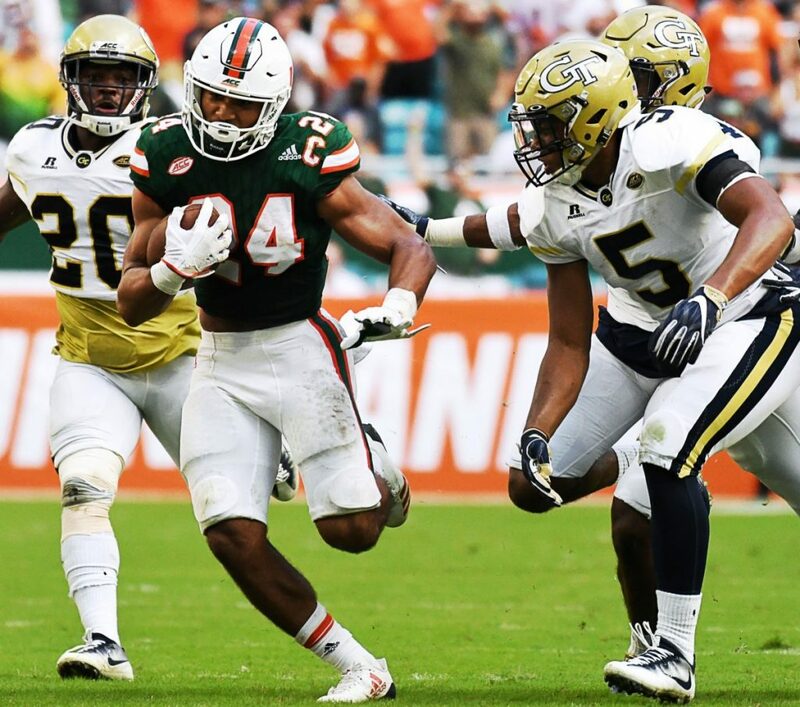 After seemingly capturing the momentum with a score right before halftime to cut the early deficit to one, the Canes put themselves in a deadly hole on the first play of the second half – one that made fans wonder if this could possibly be UM’s first loss of the season. On a failed onside kick attempt, Georgia Tech returned the loose ball 42 yards for the touchdown to give it a 21-13 lead. The Miami special team’s players hung their heads in disappointment. The Hurricanes were coming off a win that broke a seven-game losing streak to the Florida State Seminoles. The players were clearly beaten up and not in the best condition – UM was without five starters. The Yellow Jackets were coming off a bye week. Miami has the second-longest win streak in the FBS dating back to last season – it has now won 10 straight. Only South Florida has a longer streak – the Bulls have won 11 in a row. Next on the schedule for Miami: A home matchup against Syracuse at 3:30 p.m. Oct. 21 at Hard Rock Stadium. – This is UM’s fifth-straight home victory over Georgia Tech. – Miami is now one of two teams in the Coastal Division with a perfect conference record – Virginia is 2-0 in the ACC. Miami currently holds the first place spot in the division. – The Hurricanes’ defense held its opponent to under 20 first downs for the first time this season. – The Canes held their opponent to fewer than 300 yards of total offense for the first time this season. Miami is the first team in 2017 to hold Georgia Tech to fewer than 300 yards of total offense. – Badgley has made 69 field goals in his career, which trails only Carlos Huerta (1988-1991), who made 73 field goals at Miami and is the program’s all-time leader. – Miami recognized its class of 2017 Ring of Honor inductees at halftime. Former UM football greats Ray Lewis, Ed Reed, Michael Irvin, Gino Torretta, Warren Sapp and the late Sean Taylor were among those honored. Taylor was represented by his 11-year-old daughter Jackie. – The attendance at Hard Rock Stadium totaled 55,799 on Saturday afternoon. – Former Miami Hurricane and current Carolina Panthers cornerback Corn Elder was in attendance at the game.